The FW852 is an A+ rated 50/50 integrated fridge freezer. It comes with electronic control and has a 4 star rated freezer. The fridge contains 3 glass shelves, a wine rack, 2 salad crisper drawers, 3 in-door balconies, and an egg tray. The freezer also offers 4 storage compartments and an ice cube tray, making this the perfect all in one 50/50 fridge and freezer combination. The FW872 is a 70/30 integrated A+ rated fridge freezer. In the fridge it has 4 glass shelves, 2 salad crisper drawers, 4 in-door balconies and an egg tray. With the freezer boasting 3 storage compartments and an ice cube tray, this is the perfect fridge freezer combination for those wanting a fridge preference without losing 4 star rated freezer capability. The FW927 in as A+ rated 70/30 frost free integrated fridge freezer. It comes with an easy to use electronic control, LED interior lighting and a 4 star rated freezer. Inside the fridge boasts 5 glass shelves and a chromed wine rack that folds away for convenience. It also comes with 1 salad crisper and 3 in door balconies for complete food storage solutions. The freezer compartment includes 3 drawers and a handy ice cube tray. The frost free functions means you will never have to defrost your freezer again and keeps food quality to a maximum. The FW951 is an A+ rated 50/50 frost free, integrated fridge freezer. It comes with electronic control, LED lighting, open door alarm and super cool and fast freeze functions with a 4 star rated freezer. The fridge contains 4 glass shelves, 1 salad crisper, 3 in-door balconies whilst the freezer offers 4 storage compartments and an ice cube tray; making this the perfect all in one 50/50 frost free fridge and freezer combination. The FW971 is an A+ energy rated combination fridge freezer. 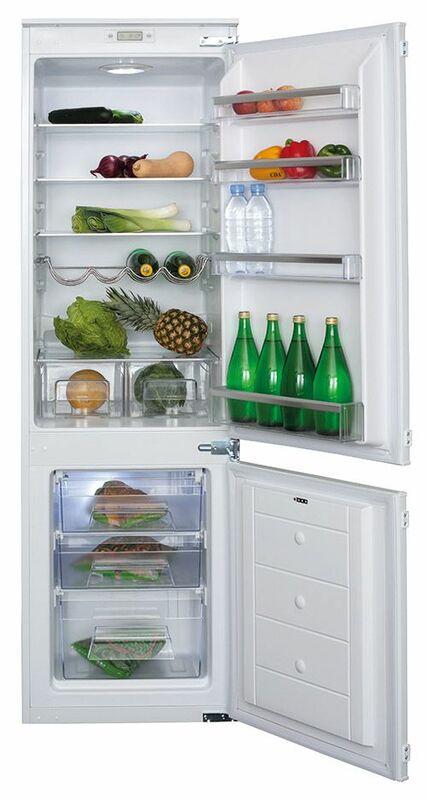 It is split, 70% fridge and 30% freezer to make the most of fresh food storage space. Both the fridge and freezer are frost free for easy maintenance and it comes with user friendly features such as an open door alarm and electronic control. Store everything together and out of sight with our range of integrated fridge freezers. We have included the latest in humidity control and multi air flow technology to keep food fresh for longer. Choose between a 50/50 fridge and freezer split or a 70/30 split for households that use a more fresh to frozen ratio. Combining the fridge and freezer into one appliance is the best option for kitchens with limited space. It is economical with width as the full height design features a fridge on top of a freezer. The décor doors of your cabinetry can be fitted to the front of the appliance using the fixing kit included and then each part of the appliance can be opened separately as you need it. Depending on how you use your cool storage you can opt for a model that features an even 50-50 spilt between fridge and freezer space. These models usually have 4 internal glass shelves, 2 salad crisper drawers and 3 door balconies in the fridge and 4 spacious freezer drawers below. Alternatively, if you prefer to have more fresh food storage and a larger fridge, we also make a 70-30 model that is split 70% fridge storage and 30% freezer storage. This is ideal for if you buy lots of salad, dairy and drinks but could use some long term storage for ready meals and meat too. This style features 5 fridge shelves and 2 salad crisper drawers with 4 in door balconies. The freezer still has 3 drawers so there is plenty of room for frozen veg, ice cream treats, ice cubes, meat and roasting joints as well as ready meals and batch cooking. All our fridges are frost free and work on a ‘wet wall’ refrigeration system. This means that they are designed so that the condensation runs down the back wall of the fridge into a drain hole at the bottom before being evaporated from around the coils at the back of the appliance. This is an excellent way to keep your food crisp and dry so make sure you don’t let food touch the back of the appliance and keep that drain hole clear to get the best performance. The FW951 and FW971 also have frost-free freezer sections so that you will never need to defrost the freezer and can use the appliance pretty much maintenance free. Extra features like humidity controlled drawers have been added throughout the range to improve your experience at home using them. Electronic control now makes it easier to set the temperature of the fridge or freezer and also to select extra features like the fast freeze setting. 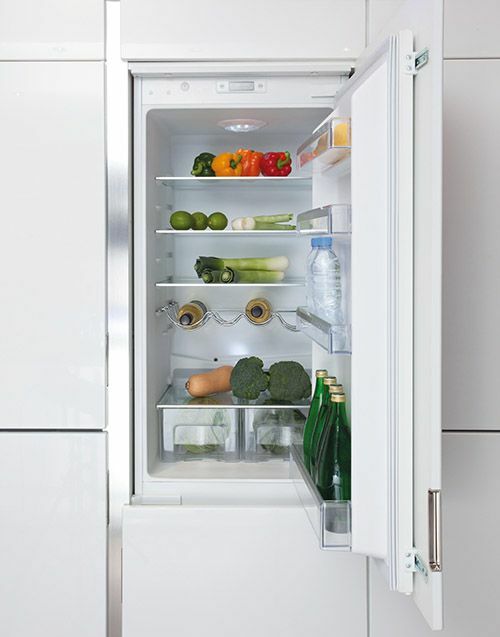 LED internal lighting is also crisp and bright to illuminate the contents of your fridge. An LED bulb can last up to 50 times longer than an incandescent one so they are much more energy efficient too. All our fridges and freezers are rated at least A+ for energy efficiency making them kinder to both the environment and to your pocket. Are integrated fridge freezers a standard size? Our range of CDA Integrated fridge freezers are designed to fit inside a 60cm wide cupboard and at their tallest are 178cm in height, with a minimum depth of 54cm and a maximum depth of 56cm. As with freestanding fridge freezers, our range of integrated fridge freezers offer the option of a 50/50 or 70/30 fridge freezer split depending on the model you choose. If you like to cook with fresh ingredients, then having a larger fridge capacity is probably going to be better for you. Whereas if you like to freeze a lot of your food or cook from frozen, then a larger freezer ratio will suit your lifestyle the best. How tall are integrated fridge freezers? CDA integrated fridge freezers vary between 177cm and 178cm tall. What width are integrated fridge freezers? The standard widths of our integrated fridge freezers are between 54cm and 56cm depending on the model you select, making them an ideal fit for installation within a standard 60cm wide cupboard. Do integrated fridge freezers need ventilation? The main consideration when installing any refrigeration unit into a fitted kitchen is ventilation. The heat removed from the cooling compartment needs to be dissipated into the atmosphere. Incorrect ventilation can lead to premature compressor failure, excessive power consumption and total system failure. For products intended to be installed into a tall housing unit, the installation requirements need to be met. Installation requirements can be found within the product manual for each integrated fridge freezer.